This article will focus on a method of how to shoot a bow based on the principals of how to shoot a bow instinctively as developed and taught by G. Fred Asbell in his book Instinctive Shooting. The instinctive shooting style, as taught by Asbell, was designed specifically for shooting recurve bows; however, it can be adapted for use with self bows and long bows with a couple of adjustments. At the core of instinctive shooting is training your body to shoot accurately without aiming. This style of shooting is the most traditional style of shooting since it does not require sights. 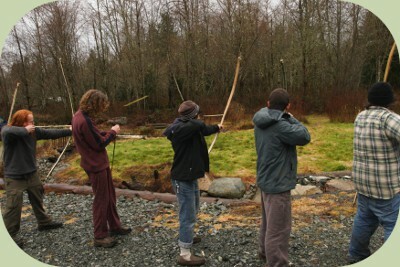 Variations of instinctive shooting date back to the earliest use of archery by humans. Since instinctive shooting relies more on archer skill than sights it is a skill that requires a lot of practice to learn and to maintain. Whether you are learning how to shoot a bow or trying out a new style of shooting, the most important thing to remember is that consistency is the origin of success. As with most physical skills, you must accurately train your body’s muscle memory in order to be effective and that means minimizing the variables involved. The best way to do this is to begin with your equipment, in this case, your bow and arrows. Firstly, it is important to ensure that you have a constant and properly placed nocking point and arrow rest if you are using a self or longbow. I will not get into nocking point placement in this article, because, as you will learn through research, nock points can vary due to the design of the bow or the preference of the archer. For the purposes of this article, I will only say that your nock point should be within the normal parameters set by the general archery community or your bow’s manufacturer, and should remain consistent while you are initially learning to shoot. Once you learn to shoot instinctively you can adjust your nock point to your liking. Arrow length, spine, and point weight should also remain consistent during the initial learning phase. Remember you are trying to train your brain and body to shoot without aiming using a sight, and in order to do that you have to have consistency in your equipment. Once you have ensured that you have consistency in your equipment the next task is to create consistency of form. Ultimately you want to train your body to recreate the same motion every time you shoot, much like a golfer practicing and perfecting their swing. To begin learning the basic form of how to shoot a bow instinctively, stand with your feet about shoulder width apart with your non-dominant leg slightly forward (similar to a fighting or martial arts stance). The instinctive shooting style, as taught by Asbell, requires the bow to be gripped in your non-dominant hand in a manner that allows your pointer finger to point directly at the target when the bow is raised. When the proper grip is obtained the wrist and arm and finger should all be in alignment. Most modern fiberglass recurve bows have handles that naturally place your hand in this position. Self bows and long bows have handles that are shaped differently from modern recurves and require some hand adjustment to get into the proper position. When learning how to shoot a bow, whether with self bows or long bows, the grip described above might feel odd at first, but if you start shooting this way it will get more comfortable with time. Once you have gotten the grip down you do not need to keep your pointer finger extended and can wrap it around the bow handle. It only needs to be re-extended if you feel the need to check your grip to make sure everything is still in alignment. Since self and long bows do not have the same molded grips as modern recurve bows the natural tendency is to grip these bows with the palm pressed into the handle. Pressing the palm into the handle requires that the wrist be bent and your pointer finger will no longer point at the target. If, as you learn how to shoot a bow, you feel more comfortable with this grip you can still learn to shoot instinctively. It is just a bit less intuitive since you are not lining up your arm, wrist, and pointer finger. Many years ago, when I was learning how to shoot a traditional bow instinctively, I was taught to shoot in this way and was able to learn and become accurate without experiencing any problems. Once you achieve the proper grip you can nock an arrow underneath your nock point. The arrow should be rested on the same side of the bow as the back of your hand. The bow should remain canted to the side at an angle that allows the arrow to sit on the arrow rest without falling off. The string may then be gripped with the dominant hand. Proper string grip is important to learning how to shoot a bow properly. Generally the first three fingers are used to grip the string (pointer finger, middle finger, and ring finger). Most archers shoot with one finger gripping the string above the arrow (pointer finger) and two below (middle and ring fingers). The string should be gripped with the tips of the fingers on the meaty part of the finger pads in between the tip of the finger and the first joint. Do not let the string fall into the first finger joint. If you allow the string to fall into the first joint your string release will not be smooth and it will negatively affect your accuracy. If you are having trouble drawing the bow with your fingertips, the bow is likely too heavy for you and you should try and learn with a lighter bow. If your finger tips become sore with shooting, which is likely, you can choose to use an archery glove or finger tab which will help protect your fingers. Once the proper string grip is achieved you can begin to start drawing and shooting your bow. The hand that is drawing the string (your dominant hand) should be kept in a straight line behind the arrow from your fingers tips through your wrist out to your elbow. Think of this arm as an extension of the arrow itself. 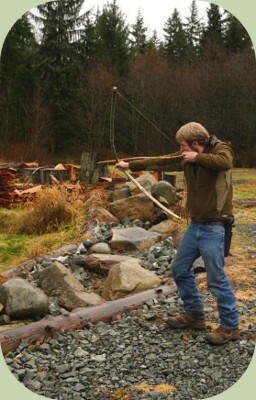 The bow should be drawn with a combination of pushing with the non-dominant hand that is gripping the bow and pulling with your dominant hand which is gripping the string. Side note, bows should NEVER be fired without an arrow. Dry firing a bow can severely damage or break the bow. Once you get the bow to full draw, you are going to need to create an anchor point on your face. When learning how to shoot a bow instinctively,a good anchor point is important to maintaining consistency in your draw length and where the arrow is positioned in relationship to your eye and head. I recommend drawing the string back to the point when your middle finger touches the corner of your mouth. The middle finger to the corner of the mouth is probably the most common anchor point and is a reliable one. After a good anchor point is established you can begin releasing arrows. Instinctive shooting relies on a combination of consistent form and intense focus on your target. This means that you must focus intently on the smallest point on your target possible and maintain that focus until after the arrow has struck. I have heard many a story of traditional archers who have clattered arrows off of or through the antlers of massive bucks. This is a testament to the importance of focusing on your desired target and the fact that once you have trained yourself in the art of instinctive shooting your arrow will go where your focus is. To release an arrow, simply draw the bow back to your anchor point keeping in mind all of the things previously mentioned. A key to learning how to shoot a bow properly is to focus intently on the target as you draw your bow. Once your finger touches your anchor point, one must simply relax the back of their hand to release the string and let the arrow fly. It is important not to hold the bow at full draw and attempt to "aim", but rather to release the arrow as soon as your finger reaches your anchor point. It is a good practice when learning how to shoot a bow to get into the habit of leaving your string hand in place on your face for a few moments after the arrow has released and taking note of its position. By leaving your string hand in place after the arrow has launched you can determine if you released at your anchor point or not. Once you have practiced a while you may need to fine tune your form a bit. One way of doing this is to have someone else watch you shoot to see what you may be doing wrong. If you have no one to watch you, you can always video yourself shooting and then play the tape back to yourself to critique your shot. Generally, if you are missing left or right there is an issue with your string release and if you are missing high or low there is an issue with your range adjustment. However, don't fret, the brain is an incredible mechanism. As long as you maintain proper form and consistency in your form and equipment, your brain will learn to adjust. Learning how to shoot a bow instinctively is a skill that is learned over time so don't be hard on yourself if you do not hit your target on the first few shots. I'm sure that the first time you picked up a hammer you didn't consistently hit the nail directly on the head, it took practice. I must admit that instinctive shooting is a bit more challenging than hitting a nail with a hammer and it requires more practice to remain efficient, but if you dedicate yourself to this ancient art I feel confident that you will find success. Visit Amazon.com for books and videos on instinctive shooting by G. Fred Asbell. About the Author: Dave Scott was an instructor at Alderleaf. He co-authored the field guide Bird Feathers - A Guide to North American Species. Learn more about Dave Scott.